In 1780 Britain was at war in a far-off land; the economy was in recession; there were riots on the streets of London; and the government, led by Lord North, was heading for an election. 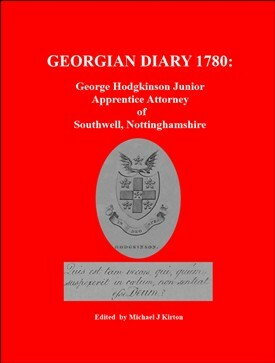 All of this, together with a record of his daily life as an eighteen-year-old apprentice attorney, is meticulously recorded by George Hodgkinson Junior who worked for his father, also George, in a busy legal practice in Southwell. This page was added by Mike Kirton on 20/06/2014.